They say you should never judge a book by its cover. Maybe so, but kids do anyway and so do adults, especially when it comes to picture books! Three Hens and a Peacock is one of those books that has spectacular and very funny cover art. On the front? -- A dismayed but fabulous looking peacock with three hens sticking their heads through his fan. On the back? -- The posteriors (a.k.a bottoms) of all four characters. Hilarious! The cover sets the tone perfectly for the book. A peacock arrives on the Tucker family's farm and the once quiet farm becomes a bustling, noisy place. The shrieking, strutting peacock catches the attention of those passing by. Many visitors stop to admire the peacock and purchase produce from the farmer's stand. With ruffled, jealous feathers, the hens complain, "that lazy peacock gets all the attention and we do all the work." Hoping to smooth things over, the farm's wise old hound suggests that the hens switch places with the peacock. The hens get all gussied up in bangles and beads while the peacock tries his hardest to lay an egg and fails miserably. Eventually, they all learn that taking another's place is harder than it looks, and they gain an appreciation for each other's unique talents. 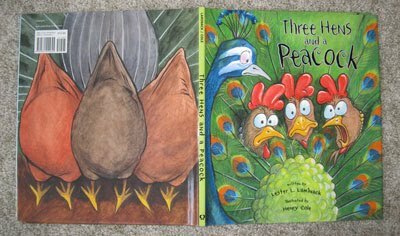 Full of plenty of humor and a subtle lesson in character, Three Hens and a Peacock is a frolicsome farmyard tale. Cole's eye-catching watercolor, ink and colored pencil illustrations play a huge part in advancing the storyline. Even the endpapers serve a purpose. The peacock feathers in the front announce the upcoming arrival of the peacock, and the back endpapers foretell the next surprising events on the farm -- hmm...what kind of animal lays a very big egg? There are plenty of ways to use the book as a teaching tool. Besides discussing the problems of trying to be someone you're not, I took the opportunity to also discuss with my kids why a peacock with a fancy feather train cannot lay an egg. I opened our DK Encyclopedia of Animals (seriously, every home library should contain at least one animal encyclopedia) and found the page about peacocks. It shows a nice picture of a peahen next to a peacock. We learned that peahens, the female birds, do not have colorful fans. Male birds sport the fancy feathers and use them to attract the females. Thus, the bird pictured in Laminack's book is a male, and male peacocks cannot lay eggs. :) We also learned that a peacock's train can reach up to 5 ft.-3 in. high! Wow, that's only a few inches shorter than Mommy! The proud, flamboyant peacock character calls for an equally stunning craft. 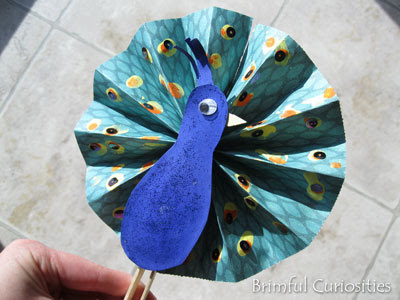 Our peacock folded fans are pretty "fan"-tastic, I must say so myself! 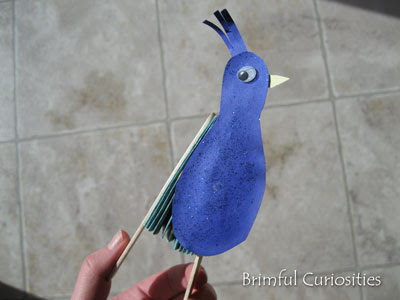 With this craft, kids can manually fold and unfold the peacock's shimmery train feathers. 1. 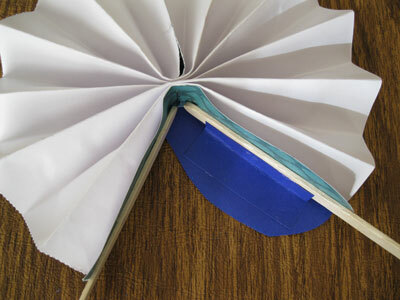 Following the Folded Fan instructions found on Family Fun, construct the circular fan. 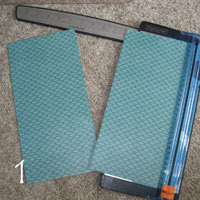 Cut a sheet of 12" by 12" green scrapbook paper in half to make a 12" x 6" piece of paper. 2. Starting with the 6" side, accordion fold the paper making the folds around 3/4' wide. 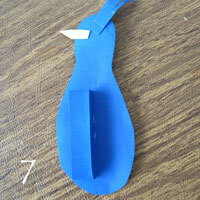 Once folded, find the center of the folded paper and staple. 3. Take two popsicle sticks and glue the sticks onto the paper, one on each side of the staple. Allow glue to dry. 4. After the glue dries, bring the two popsicle sticks together and secure with a rubber band. 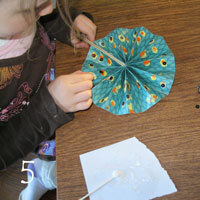 Bring the top sides of the fan together to form a circle and use invisible tape to secure the peacock's fanned out feather train. 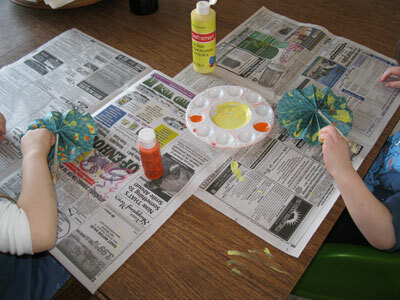 Using yellow and orange paint, dot feather "eyes" onto the fan with your finger. 5. When the paint dries, glue small sequins on top of the feather eyes to add some shimmer. 6. Cut out a peacock body shape from blue cardstock. 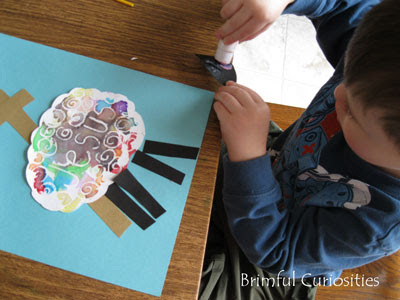 Decorate with blue glitter glue and add a yellow beak, googley eye and blue head crest. 7. Glue a folded piece of paper to the back of the body. 8. Turn the fan over. Adhere the peacock body to the fan by gluing the other side of the folded paper on the back of the body to the underside of the popsicle stick on the right (refer to picture below). Allow to glue to dry. 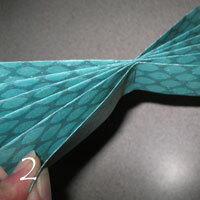 Fold the fan together and then have fun showing off the peacock's magnificent train by slowing unfolding the fan! Can you make your peacock dance? No need to buy a train tunnel when you have stacks of books readily available in your home! Choo! Choo! Last year my daughter had so much fun illustrating her own poetry book we thought maybe other kids might like to join in the fun this year! We are hosting a poetry challenge during the month of April in celebration of National Poetry Month. 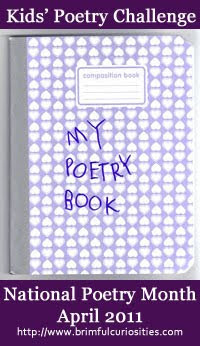 It's simple to participate and a great way to introduce children to the world of poetry. 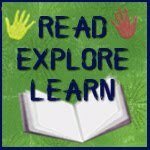 ♦ Every week in April encourage your child to illustrate a poem, any poem. If they are older they can compose their own poem and/or practice their handwriting by writing the poem on their picture. *According to the KidLitosphere site, to avoid problems with copyright, "if a poem is under copyright protection (and most contemporary ones are), only a couple of lines can be quoted under fair use." 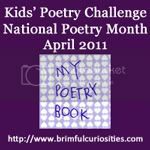 ♦ Link up to the My Poetry Book Kids' Poetry Challenge Post on Brimful Curiosities each Friday. Also, consider joining the Poetry Friday link-up during the month of April. I do hope you'll consider joining our poetry challenge. 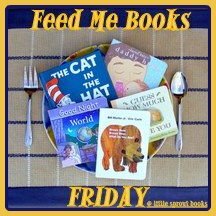 Check back this Friday, April 1st, for the first link-up. To help encourage participation, I'm giving away a paperback copy of the poetry book, The Tighty Whitey Spider: And More Wacky Animal Poems I Totally Made Up by Kenn Nesbitt, illustrated by Ethan Long. 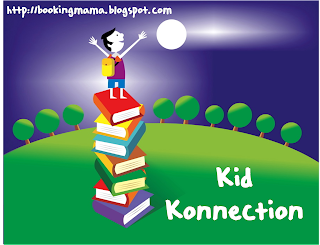 Every time you link up a post to one of my Friday Kids' Poetry Challenge posts, you gain one entry in the giveaway contest! 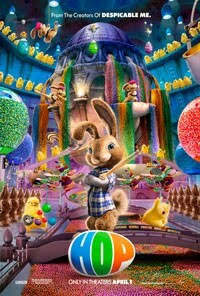 I'm sure you've heard by now, but in case you haven't, a new Easter-themed family movie by Universal Pictures is set to release on April 1st -- HOP! In this combination live-action/CGI-animated film, a bunny named E.B. (the Easter Bunny's son) doesn't want to take over the family business. Instead he runs away to L.A. to fulfill his dreams as a drummer for a rock 'n' roll band and ends up staying with a human named Fred. From the trailers I've seen of the movie, it looks like a humorous film. I couldn't help but laugh when I saw that E.B. poops jelly beans! Based on the film, the HOP chapter book covers the movie plot and features a few black and white illustrations from the movie. Of all the LB Kids tie-in books, this one does the best job telling the entire story of E.B. 's adventures in L.A. with Fred, and, later on, his fight to keep the chicks from taking over his father's factory. This tie-in book covers the very end of the movie. Led by head chick Carlos, the factory chicks try to take over the Easter Bunny's factory while his son, E.B., is away. As the chicks lower the Easter Bunny into a boiling vat of pink Easter egg dye, a large fight ensues. Luckily, the Easter Bunny has the Pink Berets and E.B. on his side. The back of the book contains a page of punch-out Easter egg holders. 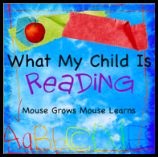 This beginner reader book follows E.B. (the Easter Bunny's son) as he takes a tour of Easter Island and the Easter Bunny’s magical workshop. In the factory, all different kinds of candy run along conveyor lines, bunnies paint eggs and chicks carve chocolate bunnies. The Easter Bunny even has a fancy sled, just like Santa Claus. Will E.B. decide to take over his father's job? Find out in the book! My daughter tried to read this one on her own, but the level is just slightly above her kindergarten abilities with words like "interrupts" and destiny." She did, however, enjoy the search and find picture challenge. Told in rhyming verse and beginning with the phrase, "Twas the night before Easter," this short board book provides an Easter version of The Night Before Christmas. For some reason, I never imagined the Easter Bunny delivering candy in a flying Easter sleigh, but according to this book, that is his preferred mode of transportation. The puppets in this book are like the ones found in the popular Despicable Me book, Sleepy Kittens. Unfortunately, unlike the kittens, the bunny puppets don't serve much of a function in the book. Easter chick Carlos narrates this small-sized board book. Along with Phil his assistant, kids are encouraged to count items (from one to ten) as they are placed into a large Easter basket. All the candy and eggs will make you hungry for an Easter treat. My toddler son prefers this book over all the others, but I do wish that the items in the book were a little bit larger so they were easier for little fingers to count. 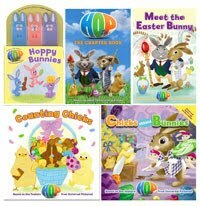 Want to win a gift set for your little bookworm's Easter Basket? Thanks to LB Kids and Universal Pictures, Brimful Curiosities' readers can enter to win a HOP Book Prize Pack. • Contest ends on Monday, April 11th, 2011 at 11:59 PM CST. Two of the books we brought home from our last library visit contain famous works of art. What an excellent opportunity to introduce my children to a few famous artists! This week we talked about Monet, Van Gogh, O'Keeffe, Matisse, Cézanne and more. It was a completely unplanned educational activity. Have you discovered any other picture books that contain versions of famous works of art? 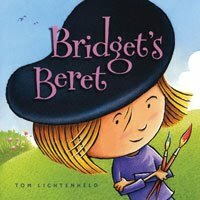 "Before Bridget made any kind of art, she'd put on her beret and adjust it just right." Bridget's favorite pastime is drawing. She has many art supplies, and, most importantly, like all great artists, she owns and wears a beret. Sadly, on a very windy day, her fabulous black beret blows away. Without the special hat for inspiration, Bridget finds herself suffering from -- *gasp* -- artist's block! Thankfully her sister comes to the rescue and helps her remember that when life hands you lemons, you make lemonade. Lichtenheld's book overflows with creativity, cuteness and plenty of clever quips and illustrations. My family is a huge fan of Lichtenheld's previous books (Duck! Rabbit! & Shark Vs. Train) and love his entertaining comic illustration style. A talking rabbit is just one of the many funny touches. He manages to craftily work in a few interpretations of famous art into this book. Bridget creates lemonade poster renditions including one of van Gogh's "The Starry Night" and another inspired by "Whistler's Mother." As soon as I read the inside jacket flap and discovered that this book was about a girl who loves to draw, I knew I wanted to read it with my daughter. Bridget's Beret is the perfect book for budding artists. The book includes a handy "How to Start Your Art" guide in the back that discusses several famous works of art: Giuseppe Arcimboldo, "Summer" - Mary Cassatt, "Child with a Red Hat" - Paul Cezanne, "Still Life with Peaches and Pears" - Vincent van Gogh, "Bedroom at Arles" - Henri Matisse, "Icarus" - Claude Monet, "Still Life with Sunflowers" - Georgia O'Keeffe, "Above the Clouds I" - Pablo Picasso, "Bull's Head" - Rembrandt Harmensz van Rijn, "Self Portrait in a Cap, Open-Mouthed" - Georges Seurat, "Sunday Afternoon on the Island of La Grande Jatte" - Alfred Sisley, "The Boat in the Flood"
"Where do you want to go? I will take you anywhere," says the train. Whoo whoo whooo. This train book is all about imaginative play. A little toy train takes various toy passengers on an adventure through a typical home cluttered with random toys and other items. The train stops at a pond (the fishbowl), the field (a painting), the forest (a potted plant) and even climbs a mountain (the couch) and drops animals off at all the different locations. 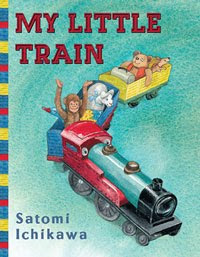 My Little Train is one of my three-year-old son's favorite books. The short, fragmented sentences are full of all sorts of sounds, making the book a lot fun to read aloud. Plus, it is simple enough for a beginning reader to chug through, and my daughter has read it to my son several times. The ending is a little weak, but the detailed illustrations by Ichikawa make up for anything the text might lack. 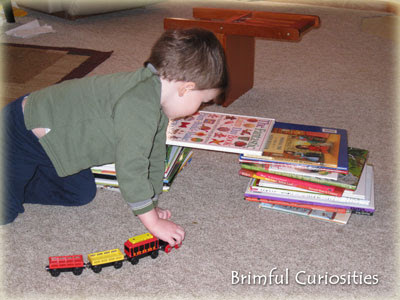 It's full of inspiring ideas for creative train play. Central Station is made from books stacked up and if you look closely, you can tell that many of the books included in the stack are ones the author wrote or illustrated. Art enthusiasts will recognize the poppy field painting where the train drops the sheep off. It is remarkably alike Claude Monet's "Poppy Field." At church, before communion, we often sing The Agnus Dei. "Lamb of God, you take away the sin of the world, have mercy on us." I often wonder what my kids are thinking when they hear the verses of the Agnus Dei. 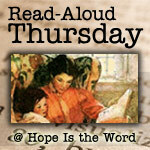 During Lent many of us teach our children that Jesus died on the cross so that our sins could be forgiven. The imagery of Jesus as the Lamb of God is a natural extension of this teaching and the symbolism is worth discussing during the Lenten season with your kids. In art, the Agnus Dei symbol is often depicted as a lamb bearing a cross or banner. We made our own Agnus Dei artwork today for our stArt project. 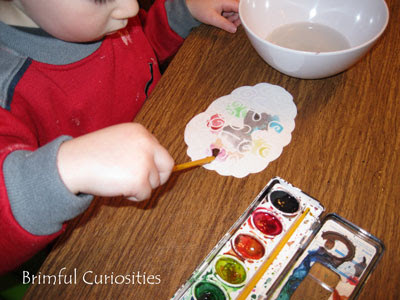 Starting with a white piece of paper, we cut out the lamb's body in a cloud shape. While the kids were busy cutting out a head and legs out of black paper, I took a white crayon and wrote "Jesus" on each of the white body pieces. I also added some white swirls to look like wool. 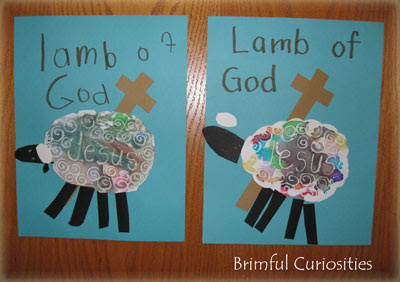 Using watercolor paint, the kids covered the lamb's body with paint and, through this wax resist artwork, it was revealed to them that Jesus is the "Lamb of God." Our sins are represented by the paint and Jesus, written in white crayon, takes away the sins of the world. I cut out a cross shape out of brown construction paper while the kids painted. After the paint dried the kids assembled their own Agnus Dei artwork. The artwork indeed reminds us that Jesus is the Lamb of God who takes away the sins of the world. My family started reading Bible stories together at the beginning of Lent, in addition to our Lenten devotions. There are many different resources available to help parents teach their children about the Bible, including several different children's Bibles. Young children yearn to hear the Word of God and it's a good idea to share Biblical stories with children starting at a young age. The best children's Bibles teach various stories using engaging illustrations and are written with simple text that the child can understand. 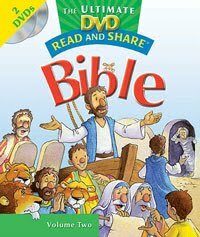 The Ultimate DVD Read and Share Bible series by Gwen Ellis is a good choice for very young children (ages 2-6). So far, there are two volumes to this set and each book contains over 100 Bible stories from both the Old and New Testament. Each story is laid out in a very brief two page segment, and retold based on verses from the Bible. There's a discussion question that goes along with each story that helps encourage active learning and because each story is so short, it can be easily read aloud to even a very young child. What I like specifically about this series is that each book contains two DVDs that show the stories in animated form. The DVDs really help bring the stories to life and reinforce the stories in the book so kids will be able to better recall what they read. Thomas Nelson sent my family The Ultimate DVD Read and Share Bible: Volume Two for review. Volume 2 begins with the Old Testament stories of Joseph and continues on with Moses and the Israelites' exodus out of Egypt. Other Old Testament stories covered include Balaam, Joshua, several stories from 1 and 2 Kings, Job, Daniel and Jonah. The New Testament stories include ones about the boy Jesus at the temple, Jesus walking on water and stopping the storm, and his interactions with Zacchaeus and Lazarus, among others. Volume two is appropriate to read during Lent and Easter because it also includes the story of Jesus' death and resurrection. I am very surprised at how interested my children are in this particular Bible set. We own other children's Bibles, but this is the first time they've shown independent interest in reading and learning about the Bible. I really think the visual aspect of the stories on DVD helps make the text more interesting to them. The music and narration are pretty mellow sounding and rather comforting. I only have a few criticisms. Unfortunately, children cannot easily follow along using the book and DVD together because the DVD does not cover everything in the book and the stories are split up rather randomly between the two DVDs. Additionally, the narration is not taken directly from the text of the book and the noses on the animated characters look a little odd. The stories are not always presented in chronological order, but rather set up more like Sunday School lessons that jump to various stories. However, I liked Volume 2 well enough that I also recently purchased the first volume so that my kids could read and listen to the other stories not covered in Volume 2. After we are finished we the set, I plan to donate it to our church so that it can be used by the Sunday School and other families. I think that overall the series provides a very nice overview of the Bible for young children. While it does not go into great detail, it provides a simple starting point for families looking to begin home Bible studies.